Why So Serious? Well maybe you need some Jokes Man! 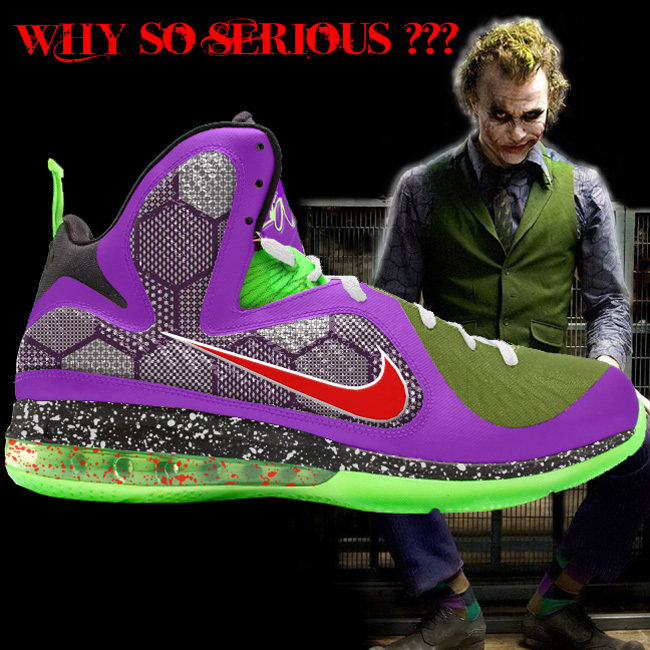 Get them in the form of these “JokerMan” Custom LeBron 9’s by your truly, Chef of GourmetKickz. Some may snicker and sneer at this shoe, but that’s the point isn’t it? And in all honesty, who didn’t have something slick to say at the site of the rather unusual Joker? That bright green hair, that purple jacket, the green waistcoat, fancy braces, amazing hex pattern shirt, Ferragamo shoes… what a dresser! So maybe you can’t pull off the same look, but surely you can pallet a dish that is concocted of all the aforementioned ingredients! The final dish is pictured and cooked extra well done if I don’t say so myself. Have a healthy helping and rejoice in these kicks as the jolly Joker would. Break necks while doing so, figuratively of course, let’s not immerse too deep into the brutal bozo of bedlam. Cop a pair after the jump or head on over to the AF1King Shop to see this new custom on the chopping block and many more. This custom Nike Air Force One Low End Theory piece was done back in 2009 during a 1 on 1 design session. 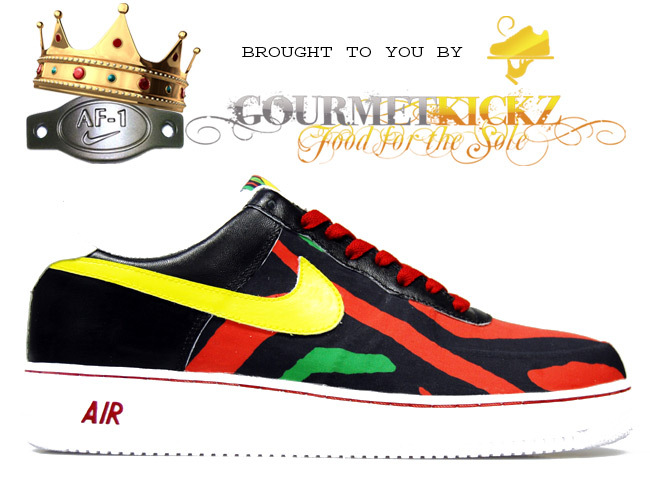 The idea came about from the then current release of the AJ1 ATCQ‘s. The result is the custom Nike AF1 you see here. A great combination of the Low End Theory Album cover art and great technical work by yours truly, Chef of GourmetKickz. I used a “seamless frontal” fabric application to properly lay out as much of the Low End Theory design as possible. This custom sneaker also features an amazing vibrant yellow on the swooshes. This yellow is very stand out and is a trademark color of mine, having been custom mixed. If you are a sneaker artist by the way, you can actually purchase this pre-mixed color from my other website. Enjoy these custom kicks as they are definitely one of my favorites. Also make note of the custom tongue tag after the jump and don’t be afraid to cop a pair for yourself.